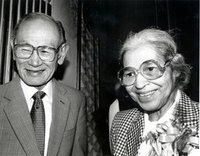 2005 - RIP Sister Rosa, Korematsu, Tookie, Corky - the Fists of La Raza, Richard Pryor and Brother BIRJ Anant of ASATA - We are all Joaquin! * Corky Gonzalez - the "Fists of La Raza" - with brother Corky's passing let's remember the lessons of the Crusade for Justice, Chicano youth and student movements, the August 29, 1970 Chicano Moratorium against the war in Viet Nam - Corky Gonzalez Presente! We are All Joaquin! * Birj Anant - lastly, a young global justice activist from ASATA/APICAW and most recently the World Social Forum and anti-WTO campaign in Hong Kong this past month. Many of us from the Chinese Progressive Association, Asian American Movement group and others just saw BIRJ upon his return from Hong Kong. and the BAYAN NorCAl statement from Kawal about BIRJ's contributions to our movements. To the memory of all those that left us in 2005. THE FISTS OF LA RAZA - We are all Joaquin! "He Was the Fist. He Stood For Defiance, Resistance"
Chicano political and civil rights activist Rodolfo "Corky" Gonzales died Tuesday at his home in Denver, Colorado. He was 76 years old. We speak with his friend, columnist Roberto Rodriguez. Chicano political and civil rights activist Rodolfo "Corky" Gonzales died this past Tuesday at his home in Denver, Colorado. He was 76 years old. Gonzales was an iconic leader in the movement for justice and equality for Mexican-Americans in the Southwest and he is credited with raising the nation's awareness of the plight of urban Chicanos. In the mid-1960"s he founded an urban civil rights and cultural movement called the Crusade for Justice which advocated Chicano nationalism. During the late sixties and early seventies, he organized walkouts, demonstrations against police brutality and marches against the Vietnam War. In 1968, Gonzales led a Chicano contingent to the Poor People's March on Washington D.C and issued a "plan of the Barrio" which demanded better housing, education and restitution of pueblo lands. Gonzales was also an organizer of the Annual Chicano Youth Liberation Conference which sought to create unity among Chicano youth. But perhaps Corky Gonzales is best known for his poem "I am Joaquin/Yo Soy Joaquin." He wrote the epic poem in 1965 and it is one of the most important literary works to emerge from the Chicano movement. See also UCSD Chicano Studies Professor Jorge Mariscal's piece on Corky from Counter Punch. Lastly, here's a link and a few excerpts from Chicano and anti-draft Movement leader Rosalio Munoz piece about Corky from People's Weekly World April 05.
peace rallies, including the November Moratorium in San Francisco where 250,000 attended. It was the Crusade for Justice that hosted a watershed event for the country. Southwest and Midwest came to the National Youth and Liberation Conference, where “Plan de Aztlan” was produced. The legendary plan called for cultural and race pride and independent political action. The event galvanized the youth movement. It stands as a foundation for today’s Latino political power, vital to all U.S. progressive struggles. In 1970, a second conference was held. I went and was fortunate to head up the peace workshop where we developed plans to hold a National Chicano Moratorium in East Los Angeles on August 29, 1970. The plenary of nearly 2,000 unanimously approved the motion I brought from the workshop. A reporter named Ruben Salazar put the plans on the front page of the Los Angeles Times. Thirty thousand marched at that demonstration. The local police and federal agents viciously attacked us. They killed Salazar and arrested Gonzalez on trumped up charges. The FBI hounded Gonzalez and the Crusade well into the 1980s. I attended a memorial for Corky organized by Mecha student leaders on April 14. Without permit we occupied the big gondola of La Placita Olvera, the historic first plaza of Los Angeles. We lit candles, recited all of “I Am Joaquin,” and reflected on what Corky’s life and poem meant to us. Many global justice and Asian American Movement folks will miss BIRJ's warmth and never forget his commitment and movement-building work for a better world and future for us all. With an Asian American delegation representing garment workers and migrant rights. "The idea that the WTO is going to be a panacea for the ills of developing countries and benefit the poor is all propaganda. The negotiating position is still formulated by elites that will benefit from it." We are deeply saddened to have learned yesterday that our loved comrade brother Birjinder Anant apparently passed away in his Oakland apartment sometime during the last few days. We are awaiting reports and autopsy results which will provide more details on how this tragedy occurred. Birjinder just returned from the World Trade Organization Ministerial international resistance activities with a large Bay Area AsianPacific Islander No to WTO delegation. He met with many of our Filipinocom patriot organizations and allies while in Honk Kong just days ago. 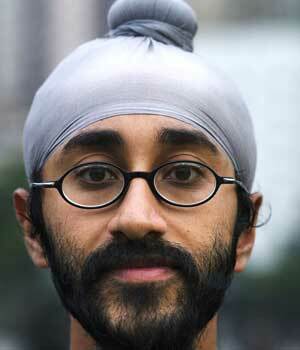 He is also a founding member of APICAW representing the ASATA - Alliance of South Asians Taking Action - for many years. Birjinder has been on the frontlines of anti-war people of color resistance in the Bay and internationally for aslong as most of us have known him. We remember him vividly gently smiling yet fiercely confronting thecontradictions of huge wealth and economic starvation, and the clash betweenempires waging war and people wanting peace, liberation and democracy. We observe Birjinder and on the front security lines protecting Strength inUnity contingents in major actions with the commitment of a proud son of the people. Have a Happy Holiday and a peaceful 2006.
with school, and human needs. for that cost of the war and occupution. Click here to Embed a counter in your own web page! 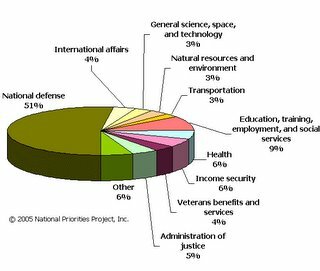 In April, 2003 an intergenerational team of Niko Matsakis of Boston, MA and Elias Vlanton of Takoma Park, MD created costofwar.com. After maintaining it on their own for the first year, they gave it to the National Priorities Project to contribute to their ongoing educational efforts. SF Garment Workers Take the Struggle to City Hall and the WTO meeting in Hong Kong! Many parents in our San Francisco public schools are garment workers and other service sector hotel and restaurant workers. These posts below show some of the difficulties and uncertainties in the lives of many parents and their children in San Francisco west and east side neighborhoods like the Richmond [where I live], the Sunset, but also Chinatown, Visitacion Valley, the Tenderloin, the Portolla and the Bayview Hunters Point communities. Because of the rise of Globalization or Global Capitalism, as some call it, garment industry workers in SF have been decimated from 20,000 in the 1990's to only about 2000 today. But San Francisco Garment Workers are resisting the negative impacts of globalization and taking their struggle not only to San Francisco City Hall but also to the global powers at their WTO meeting Hong Kong. 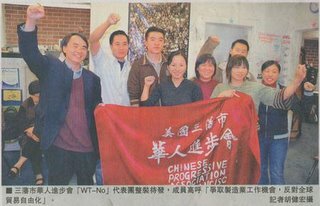 For example, former Nova Knits workers have organized themselves with the help of the grassroots Chinese Progressive Association. And, these workers and their allies are taking their fight straight to the WTO - meeting in Hong Kong later this coming week - and to a grassroots conference of global justice organizers and activists that begins today in Hong Kong. They are makers of history, not the elites. 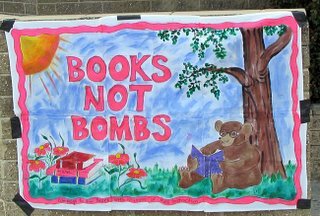 Check out these great posts from the Bay Area anti-globalization warriors who blog at BAYAREA WT-NO! This is a link to the Up Front Radio story, featuring, among others, Workers and Alex from CPA, Victor Menotti from IFG, and a professor from UC Berkeley. Publlished Dec 6, 2005 on New America Media website. The garment industry has a long history in San Francisco, starting when Levi Strauss and Company opened its first factory here nearly one hundred years ago. In the early nineties, there were 20-thousand garment workers in San Francisco. Now, only about two thousand remain as jobs moved to Mexico and China. Ironically, all of San Francisco’s garment workers are Chinese immigrants, many of them middle-aged women who don’t speak English and have few transferable skills. Zoe Corneli reports, a pilot program in San Francisco is giving these garment workers new hope in the new, global economy. Lastly, the Hong Kong People's alliance has a great website too with lots of info and perspectives from the struggle for global justice in the East. 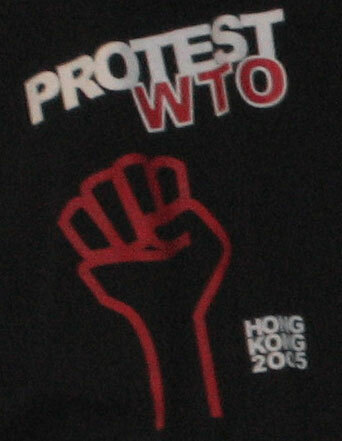 Events begin today and conclude with a massive Concert Against the WTO at Victoria Park! Wish I were there. But there are many young activists from the SF Bay Area that will be bringing back their stories and adventures. TU-NGO Seminar Workshop on "HK's Missing Agenda: SDT and Development for LDCs"
WAR AND TRADE: Militarism and Neo-liberalism - a two-headed monster? Forum on Trade and War: Junk WTO! Resist Imperialist Plunder and War! NYC Black Radical Congress leader Sam Anderson critiques NYC Superintendent Joel Klein's claims of 'closing the gap' .... from the NYTimes article from December 2, 2005. Anderson was a founding member of the NY Chapter of the Black Panther Party and now serves as Education Director at Medgar Evers College’s Center for Law & Social Justice. Malcolm X said (I'm paraphrasing): When a man with a 12 inch knife in your back pulls it out 3 inches, you don't call that "Progress." The Bloomberg/Klein spinmasters at the NY Times have produced another "gem" of mythical propaganda with Dec 2's news article rosily headlined: "City's Schools Cut Racial Gap in Test Scores". (the link to the full article below) also visit <http://nces.ed.gov/nationsreportcard> for the data. DAVID M. HERSZENHORN's raggedy mishmash article is a classic attempt to abuse statistics for the sake of shoring up and covering up a major corporate-sponsored education implosion. Herszenhorn and The Times can get away with it because 99% of US citizens don't have a clue about analyzing statistical data. Let's be real here: there is a real educational meltdown going on in NYC's public schools (as well as the rest of the US's public education system). "The results are divided into four categories: below basic, basic, proficient and advanced." What The Times DOES NOT tell you is that "below basic" and "basic" are actually about being super-illiterate/innumerate and functionally illiterate/innumerate. A "proficient" score means that your child is AT grade level. The National Assessment of Educational Progress (NAEP) lumps the "basic" level with the "proficient" and "advanced" levels, thus distorting the reality of literacy and numeracy in the US. It prettifies a national horror of tens of millions of academically ill-prepared young citizens (but that's what present-day capitalism needs!). So when you go to: <http://nces.ed.gov/nationsreportcard> and look at the stats, regroup the stats to have basic and below basic together to get a better picture of the depth and breadth of US miseducation. For example: if we look at the nationwide Black 8th graders Math scores this way, we'll see that 92 out of 100 Black 8th graders are incapable of doing -at best- 7th and 8th grade math! And 89 out of 100 NYC's Black students are in the same devastating state. see: data. "Mirroring a nationwide pattern on state by state results released last month, reading scores in the urban districts were up in the fourth grade but flat or lower in the eighth grade." So how's this education progress when by the 8th grade, most children -at best- know only as much as they did in the 4th grade? "New York City's strongest results over all were in fourth-grade math, with the number of students scoring at the basic level up 6 percentage points, to 73 percent, from 2003." (3) Give the test earlier in the year, thus testing more 3rd grade material than 4th grade material. (4) systematically weed out low performing students test time. "In fourth-grade reading, New York City's gap between the average score of black and white students shrank by 10 points. Among Hispanic students the gap shrank 7 points." 10% and 7% shrinkage from what gap? It's never revealed. So these numbers sound good but have no context. How wide was the gap? That's key to see how much progress is being made and how long it will take to achieve parity. "In all, 36 percent of white fourth graders achieved reading proficiency on this year's test, compared with 16 percent of black students and 15 percent of Hispanic students." 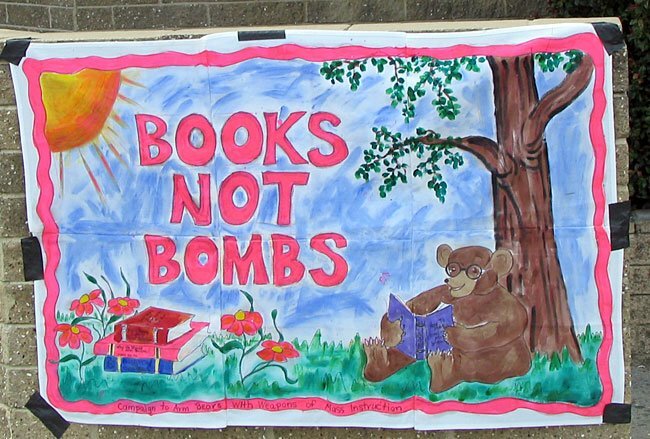 64 out of 100 white 4th grade students being illiterate is an alarmingly horrific figure! But the Times hides this horror thru its glazing data-ese. 84 out of 100 Black 4th grade students can't read and 85 out of 100 Latino students can't read. This is beyond horrific. This is educational genocide. But all this is counched in the shroud of "progress" and "gap closing." I am convinced that if white, Black, Latino parents are given test data in this manner, there would be more outrage and action against Bloomberg/Klein (mis)education policies. But the Times's job is not to give a true picture of the education crisis. There job is to say: "You're doing a good job Bloomie!" "...New York had the most striking gains in fourth-grade reading scores, with 57 percent of students testing at the basic level this year, up from 47 percent in 2002...."
(1) How do you get 57% from the data state above: 36% white proficiency, 16% Black profiency and 15% Latino profiency? Even if the Asian and "other" 4th graders scored 100% proficiency (which they did not), they only constitute an even smaller-than-white-students percentage of 4th graders. (2) Don't forget: not ALL 4th graders took the tests: thousands were "absent" from the exams thru various underhanded bureaucratic maneuverings. "But while New York City could boast of encouraging gains in several areas, the overall picture of student achievement remains sobering. The results showed that in the city 43 percent of students remained at the below basic level in reading in the fourth grade. And eighth-grade reading scores fell slightly on the federal test, to 20 percent at the proficient level from 22 percent in 2003. The eighth-grade reading scores were the one area where the gap between white and black students widened." (1) Education regression is progress according to The Times: "sobering progress." I hate to see "drunken progress." (2) Now we see reality: "...eighth-grade reading scores fell slightly on the federal test, to 20 percent at the proficient level from 22 percent in 2003." Translation: By the time your 4th grader gets to an 8th grade class in NYC public school system he/she will most likely be among the 80 out of 100 who CANNOT READ at either the 7th or 8th grade level (because the test content is really wieghted on 7th grade material). (3) "The eighth-grade reading scores were the one area where the gap between white and black students widened." Why is the widening happening? "Mr. Klein played down the fact that gains were made in moving students to the basic levels, but not to the level of proficiency required by President Bush's signature No Child Left Behind law." Bloomberg/Klein Progress = getting students to basic level NOT proficiency level. Emphasize this to parents and media rather than he reality that the city's children are, for the most part, functionally illiterate. "New York City's gains among black and Hispanic students were also accompanied by drops in scores among white students that both national experts and local school officials were at a loss to explain. Some said the drop might be a result of the fact that the National Assessment of Educational Progress tests a sample of students rather than the entire district. Both gains or declines in scores must exceed the margin of error to be statistically significant." The Real Deal: When you gear all your teaching to making sure students pass exams, this has a ripple effect thruout the system. One result is "white student alienation." That is, there are culturally given expectations for white student's intellectual development. Their family, their friends, their neighborhood expects that. But being immersed in a test-driven schooling system collides with these expectations by the time of the 8th grade test. Remember, most of these white students and their families are already looking at high school and college. But many of them have experienced only teaching-to-the-test and very little critical thinking that's essential for being college bound. Hence, many white students join the ranks of the academically aliented... and just tune out of his miseducation scene. The National Assessment of Educational Progress's sampling is done in the standard scientific manner: maximizing the possibility of getting a true representation of NYC's white student population. So... don't blame NAEP for the white student score decline: it's a result of years of teaching-to-the-test having a negative impact on thousands of white teens. "Mr. Easton, one of several officials making the presentation, cited research in Chicago showing that ninth-grade outcomes are highly predictive of high school success or failure, and he noted that black eighth graders in about half of the urban districts had very low math scores." This telling fact is buried near the end of the article. One thing we never see in these news articles is projection. That is, given these data how long will it take for Black/Latino 4th and 8th graders to reach parity with white/Asian students? They don't want us to look at this because it would reveal that it would take DECADES to reach parity. Remember, the education gap existed from the end of slavery and was exacerbated by segregation's separate and unequal policies both NORTH and SOUTH. Only total systemchange based on the premise that education is a Human Right can reverse this education pogrom/implosion. No Bloomberg/Klein mandates of corporate intervention can do it. No moral and intellectual suasion with Bloomberg/Klein can do it. It's parents, students, teachers, communities emnvisioning another educational system grounded in critical thinking and truly embracing New York's vast cosmopolitan culture and fighting to make it real. Some of my SF State students, friends from the Chinese Progressive Association, CJWP, the Asian American Movement Collective, PODER, SWOP, and close allies in the environmental justice movement are heading to Hong Kong Dec 10-19 for a major gathering of grassroots organizers and advocates from around the US and the world. Please support them if you can. OAKLAND and SAN FRANCISCO, CA – A national delegation of over 50 people of Chinese, Taiwanese, Vietnamese, Korean and South Asian descent called WT-No!, is going to Hong Kong this December. They are not going holiday shopping. 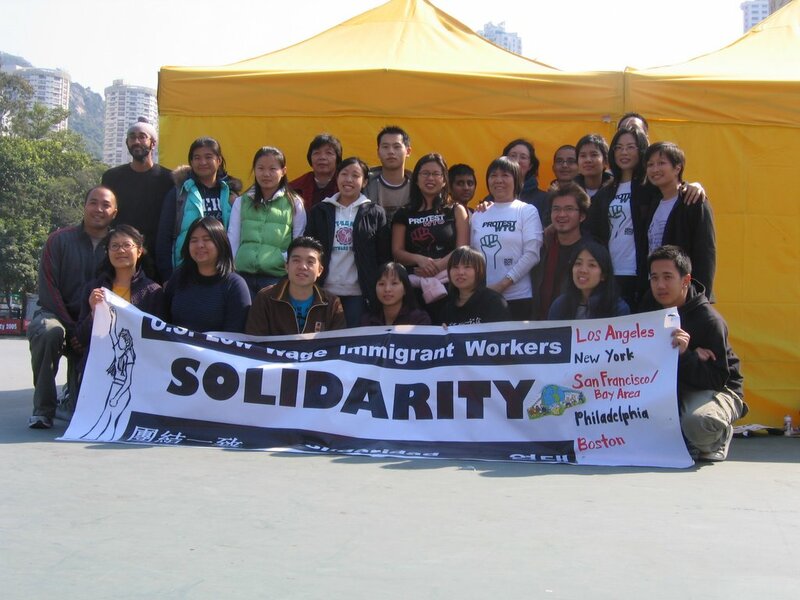 The delegation is part of a broad coalition of Asian & Pacific Islanders including former garment workers, youth, immigrants, activists, organizers, artists, teachers and students who will be connecting with organizations in Hong Kong whose members have shared similar experiences from the impacts of globalization and trade liberalization, and to show solidarity with other workers worldwide. Blog: http://bayareawt-no.blogspot.com/; Photos and Videos will be uploaded or linked to this site. Lisa Zhou was one of nearly 240 garment workers abruptly terminated in 2001 after having worked for months without pay. In 2002, nearly all of the former garment workers received close to $1 million in back wages. Zhou had come a long way during that year, when the intimidation tactics of her former employers made the workers fearful of taking any public action. Now, three years later, she and over 20 other people from the Bay Area are taking another public action, this time near her old home court of Guangzhou. Zhou is part of a national delegation of over 50 Asian and Pacific Islander Americans participating in the global protests against the Sixth World Trade Organization (世界貿易組織) Ministerial Conference. They are also going to show solidarity with workers abroad, who in many cases have also experienced subminimum wages, no wages, lack of jobs and/or massive layoffs tied to global trade liberalization. According to Colin Rajah, of the Oakland-based National Network for Immigrant and Refugee Rights, Mode 4 of the General Agreement on Trade in Services (GATS) could increase the abuses by employers of workers like Zhou. “Through its “Mode 4” deal, the WTO is proposing to create a global guestworker program that will enable corporations to dictate the flow of temporary workers -- whose rights and immigrant status would be tied to their employer, exposing them to significant abuse such as those endured by Braceros and other guestworkers, with no possibility of permanent residency. We want to highlight how trade agreements struck by the WTO have caused communities to lose their livelihoods and forced people to migrate, while using immigrants as cheap, disposable labor for corporations,” said Rajah. WT-No! is a collaboration between Bay Area-based organizations including Chinese Progressive Association (華人進步會; http://www.cpasf.org), Chin Jurn Wor Ping (前進和平; http://www.cjwp.org), National Network for Immigrant and Refugee Rights (http://www.nnirr.org/) and the Korean Community Center of the East Bay (http://www.kcceb.org); and nationally, with the Garment Workers Center in Los Angeles, Organizing Asian Communities (http://www.CAAAV.org) in New York, and Community Organizing Committee (CYOC) in Philadelphia. VISUALS: mass mobilizations, Chinese, Korean, Vietnamese, South Asian organizers and delegates to the NGO conference, direct actions, street theater, signs, banners, etc in many languages. AUDIO / VIDEO: Interviews with SF Chinese garment workers, Hong Kong garment workers, meetings between garment worker organizations in Hong Kong, video / audio of mass mobilizations, multiple languages (English, Cantonese, Mandarin, Spanish). o Education / media / art: A 29-year old Chinese Vietnamese Oakland schoolteacher who teaches young people in Oakland to make videos is going to be making videos herself, in Hong Kong, at the protests to stop the negotiations. Find out who she meets and talks to. o Environment / environmental justice / activism: A 24-year old Chinese American environmentalist networks with other communities affected by diesel pollution from port-related shipping traffic. Find out how global communities are dealing with diesel pollution and how WTO affects port-related shipping. o Youth / immigration / diaspora: A young 26-year old Chinese American woman goes back to Hong Kong for the first time to join the protests and to show global solidarity. Find out how she experiences this return trip under very special circumstances. For more information on how to contact the delegation, please contact Diana Pei Wu; (510) 847-9339; dianapeiwu@gmail.com.